This genus is present in Himalayas and other mountain areas and is present in tropical and subtropical montane rainforest, in the weed-tree forests, in valleys, and mixed forests of coniferous and deciduous broad-leaved trees, from southern China, India, and Southeast Asia. 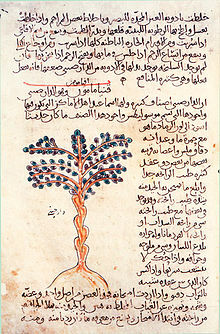 Some species, such as Cinnamomum camphora, tolerate drought. All species tested so far are diploid, with the total number of chromosomes being 24. This Lauraceae genus comprises more than 270 trees and shrubs and most are aromatic. Some trees produce sprouts. The thick, leathery leaves are dark green, lauroid type. Laurophyll or lauroid leaves are characterized by a generous layer of wax, making them glossy in appearance, and narrow, pointed oval in shape with an 'apical mucro', or 'drip tip', which permits the leaves to shed water despite the humidity, allowing respiration from plant. Mostly, the plants present a distinct odor. Their alternate leaves are ovate-elliptic, with margins entire or occasionally repand, with acute apices and broadly cuneate to subrounded bases. Upper leaf surfaces are shiny green to yellowish-green, while the undersides are opaque and lighter in color. Mature leaves are dark green. Young leaves are reddish brown to yellowish-red. The leaves are glabrous on both surfaces or sparsely puberulent beneath only when young; the leaves are mostly triplinerved or sometimes inconspicuously five-nerved, with conspicuous midrib on both surfaces. The axils of lateral nerves and veins are conspicuously bullate above and dome-shaped. Terminal buds are perulate. The axillary panicle is 3.5–7 cm long. It is a genus of monoecious species, with hermaphrodite flowers, greenish white, white to yellow are glabrous or downy and pale to yellowish brown. Mostly the flowers are small. The perianth is glabrous or puberulent outside and densely pubescent inside. The purplish-black fruit is an ovate, ellipsoidal or subglobose drupe. The perianth-cup in fruit is cupuliform. About 250 species are known, including several commercially important ones. 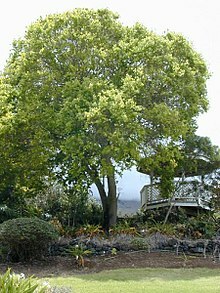 Cinnamomum parthenoxylon and Cinnamomum camphora are large evergreen trees that can grow to 30 m in height and 3 m in diameter, with broadly ovate crowns. Terminal buds are broadly ovoid or globular, and covered with sericeous scales. Bark is yellowish-brown with irregular vertical splits. Branches are light brown, cylindrical, and glabrous. The inner bark of several species is used to make the spice, cinnamon. 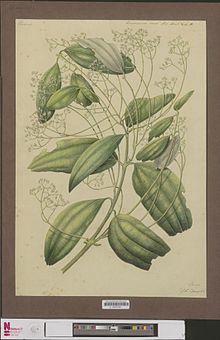 Other notable species are C. tamala, used as the herb malabathrum (also called tejpat and Indian bay leaf), and C. camphora, from which camphor is produced. ^ Ravindran, P. N.; K. Nirmal Babu; M. Shylaja (2003). Cinnamon and Cassia: The genus Cinnamomum. CRC Press. p. 59. ISBN 978-0-415-31755-9. 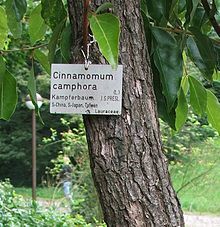 Wikimedia Commons has media related to Cinnamomum.